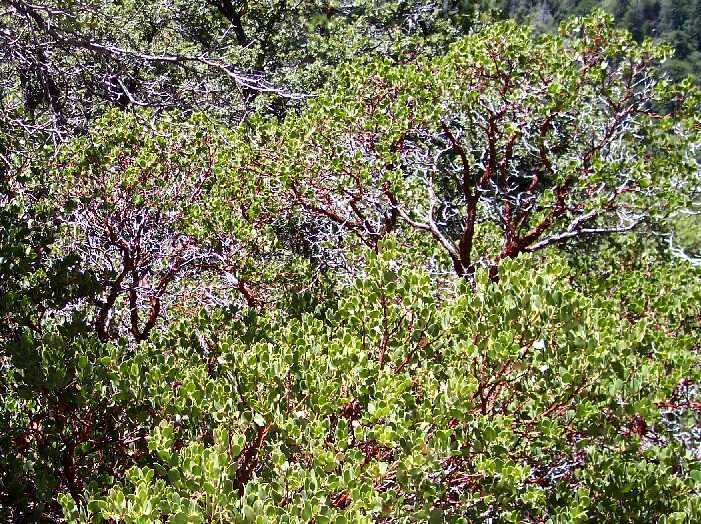 For several trips in Summer 2006, I was quite confused about a few manzanitas in the middle elevations of the Devils Slide Trail. At lower elevations, there are very clear examples of Arctostaphylos pringlei ssp. drupacea (henceforth referred to as A. pringlei for brevity); at higher elevations, there are very clear examples of A. patula. But in the overlap region in elevation of these two species, I have previously been unable to definitively determine the identification of two specimens. On some trips, I've called them A. patula, but on other trips, I've called them A. pringlei, depending on what character I was using for the identification on each trip. The basic problem is that these plants mostly have the green leaves of A. patula, but the stalked glands of A. pringlei. The shape of the bushes can resemble either species. If you just visually examine these plants from afar, these bushes seem clearly to be A. patula from the color of the leaves and the shape of the plant. But close examination to check for glands makes it appear that these are A. pringlei. Since these plants are at the upper end of elevation for A. pringlei, and the lower end of elevation for A. patula, my first thoughts were that these were just the marginal forms of one of these taxa, and I just had to figure out which taxa they were. Taxa often appear different at the ends of their ranges. On successive trips, I marched through the use of various characteristics that were supposed to separate the species, including pedicels glabrous or not; blades glabrous or not; inflorescence bracts leaf-like or not, pink-colored or not; and sepals appressed in fruit or not; without achieving satisfactory results. The intermediate specimens gave conflicting determinations depending on the characteristic used. Worse, some without-doubt specimens of both species did not have the characteristic as claimed in the floras for some of these characteristics, so they could not be trusted for the intermediate specimens. On 11 August 2006, I was down to the last difference I could find, fruit glabrous or not. I thought this was going to do the job, since I had previously noticed that A. patula fruit was always completely glabrous, and A. pringlei fruit was so glandular you didn't want to touch them. I excitedly examined the first problematic plant, and found that the fruit was almost glabrous to the eye, but not quite. Microscopic examination showed the fruit is sparsely to moderately covered with stalked glandular hairs with stalks of ~0.1 mm. It then finally dawned on me that these specimens might indeed be hybrids. I took samples on that day, and found that each putative identification of a pure species (A. patula or A. pringlei) failed on five separate characteristics. This was consistent with a hybrid hypothesis. Unlike most botanists, my first thoughts were not of hybrids, since I have repeatedly found that botanists vastly overestimate how many true hybrids or hybrid swarms exist in Nature. Many "species" and their hybrids found in earlier floras have gone away in more recent floras as botanists have recognized that these were simply a single species with a larger variation than was originally recognized. 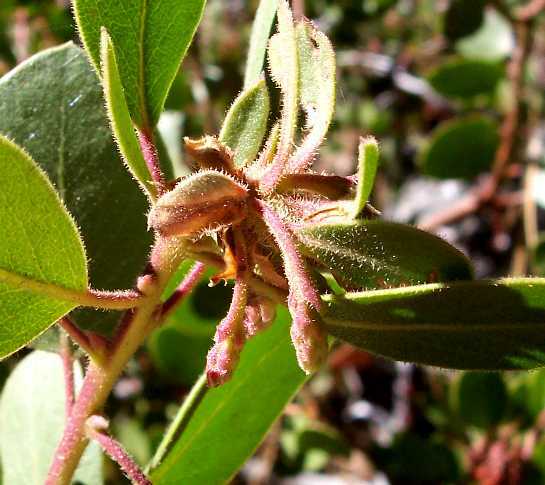 For example, using Munz 1974, the very first Amelanchier specimen I keyed out in the San Gabriel Mountains had the petal characteristics of A. utahensis, but the styles and veins of A. pallida. This would have been considered a "hybrid" of those two species in 1974. But in the 1993 Jepson Manual, those two species, along with A. covillei, have all become A. utahensis, eliminating all the putative hybrids caused by the spurious additional species. Hence another possibility for the troublesome specimens here is that A. pringlei comes in two forms with differing glandulosity. The differences from an A. pringlei identification were primarily one of degree of glandulosity, so this was a fairly compelling hypothesis, especially in light of past hybrid claims. To try to definitively determine which of these hypotheses was correct, on 16 August 2006, I measured twenty characteristics for seven specimens in the field. Quantitative analysis of that data clearly supports the hypothesis that these specimens are F1 hybrids between A. patula and A. pringlei. The hybrid hypothesis is strengthened by the physical location of these specimens at the only elevation where the two parent species overlap. The hybrid hypothesis was then dramatically confirmed by the observations and analysis of the nascent inflorescences on 29 September 2006 and 8 November 2006. As is often the case, knowing what to look for is everything. There is no difficulty in immediately recognizing whether a given specimen is A. patula, A. pringlei, or a hybrid between the two. The following pictures show the differences. At mile 1.10, just a few steps downhill from the trail, the two species grow together. A. patula is the low-growing shrub in the front that is ~4x wider than tall, with green leaves; A. pringlei is the taller shrub in the back that is ~2x wider than tall, with gray-green or white-green leaves. Not surprisingly, the habit of the hybrid is intermediate between the two. The plant in the following picture is at mile 1.11, just up trail 50 feet or so from the two plants shown above, immediately next to the trail on the downhill side. 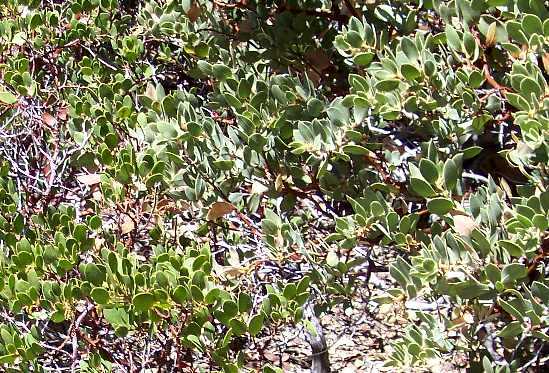 All the manzanita parts in the picture are from a single hybrid plant. It has the upright stems in the background, with prostrate stems in the foreground. Not every hybrid plant has both upright and prostrate stems, but most are noticeably intermediate between the habits of the two parent species. The leaf color of the hybrid is green, similar to A. patula. The difference in leaf color between the two species is caused by an abundance of sticky stalked-glandular hairs in A. pringlei. The following picture shows leaves of the three plants above, with A. patula on the left, the hybrid in the middle, and A. pringlei on the right. These pictures have a bit higher resolution than your naked eye, so that the differences can be seen clearly. If you know what to look for, you can see most of these differences with your naked eye in the field; they will be easily seen with a hand lens. 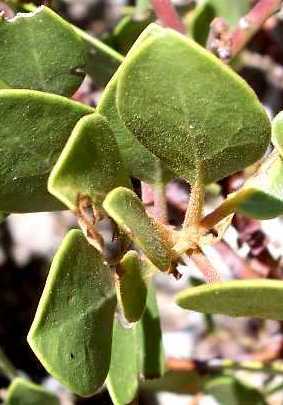 A. patula has an almost glabrous leaf, readily seen by eye. Contrary to the floras, which state the leaf blade is glabrous, the blade does have minute hairs that are easily seen with a microscope, both on the blade surface and edges, especially near the petiole. Those minute hairs can just be seen in the photograph above on the lower half of the uppermost leaf where they are in focus. Its petiole has its famous gold, glistening glands on very short stalks, which are just barely discernible as short-stalked little gold-brown blobs in the picture above and require a hand lens to see clearly. 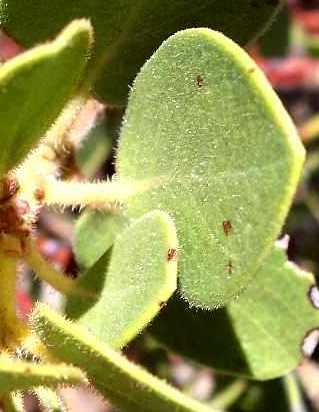 The leaf of A. pringlei is covered with long-stalked glands. The glands are so abundant that if you touch the leaf between your fingers, you'll say YECH!! and won't make the mistake of touching the leaf again. All parts of A. pringlei, including the petioles, pedicels and fruit have the same very sticky glands. These glands are easy to see by eye, warning you not to touch these plants again. Even the ruler I was using to measure the characteristics began to get sticky while measuring A. pringlei! The leaf of the hybrid is seen to be intermediate in the picture above, despite its green color. 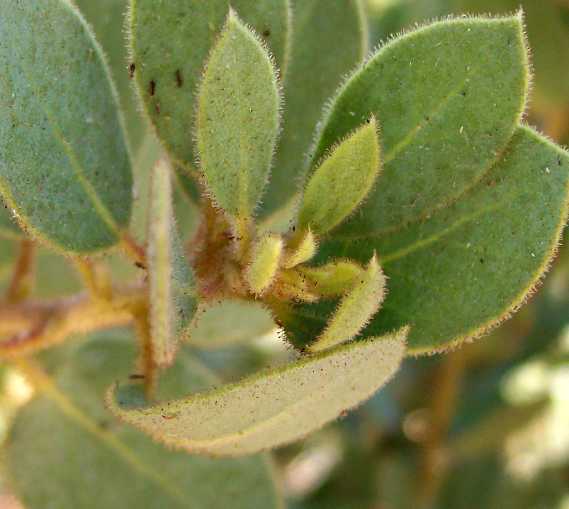 In the picture above, it has obvious hairs, many with glands at their end, around the edge of the leaf blade, and sparse long hairs on the blade surface. However, these hairs are hard to see without a hand lens, making the leaf look glabrous to the eye and similar to the leaf of A. patula. However, notice the petiole of the hybrid has long hairs similar to those of A. pringlei. These hairs can be seen by eye, and provide one way to differentiate the hybrid from A. patula. The uppermost leaf of A. pringlei appears green in the above picture for two reasons. First, in this higher-than-eye-resolution picture you are seeing separately the white hairs and the green leaf surface between the hairs. Normally, the eye just sees the combined effects of both, making the leaves appear white-green or gray-green. The out-of-focus leaves in the picture show this effect. 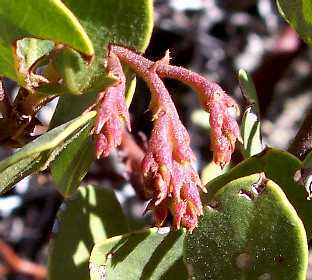 Also, manzanita leaf color is strongly dependent on illumination. In particular, leaves photographed with sun shining through them almost always appear green, independent of their true color. 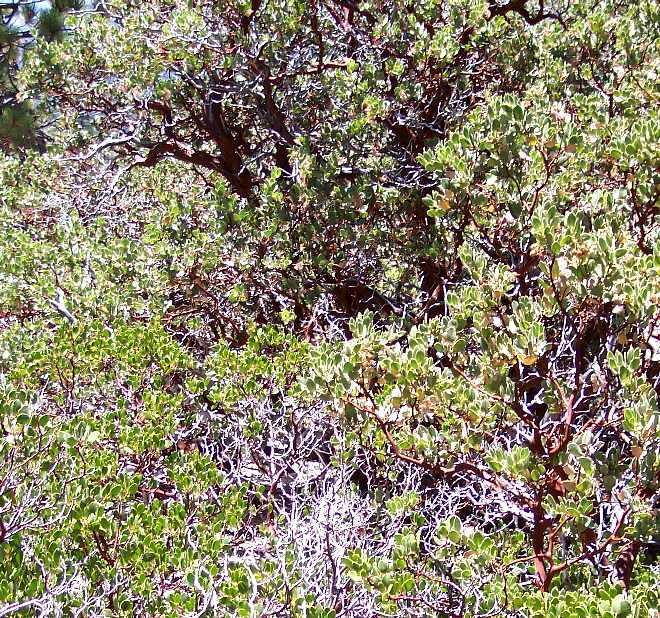 It is sometimes almost impossible to discern the true leaf color in a photograph of a single manzanita species, or even by eye when viewing only a single plant unless you have a reference in your mind or nearby on the trail with which to compare it. The flower bracts and fruit also readily distinguish these three taxa. The following picture shows the inflorescence in fruit, with A. patula on the left, the hybrid in the middle (from mile 1.11), and A. pringlei on the right (from mile 1.10). 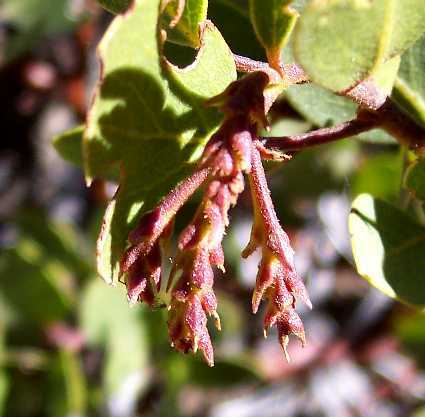 The A. patula fruit is from a plant on the PCT above Saddle Junction, since very few fruit set on A. patula in 2006 below Saddle Junction. It is not possible to be confused by the fuzzy, sticky, hairy fruit of A. pringlei; if you see that, you're looking at A. pringlei. While the fruit of A. patula and the hybrid may look similar in the above pictures, the hybrid fruit is actually sparsely to densely minutely glandular-hairy under the hand lens. This is an easy way to distinguish these taxa if you have a hand lens; however, be careful in handling the fruit before viewing since the hairs are easily rubbed off. These two species are easier to tell apart by looking at the pedicels, which are glabrous for A. patula and obviously-stalked-glandular for the hybrid. It is pretty obvious from all of the above that the hybrid combines the characteristics of its two parents. The detailed analysis below shows that the plants analyzed in detail are consistent with being F1 hybrids from the direct cross of the parents. Feel the twigs, leaves, or fruit. If you go Yech! 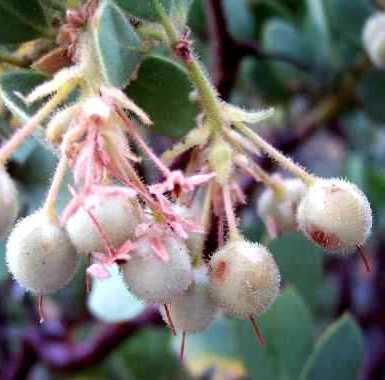 !, and vow never to touch another manzanita again, you've found A. pringlei. If you have fruit on the plant, which are present for most of the hiking season on most plants, look at the pedicel. If it has no hairs at all on it, you've found A. patula, which can be confirmed by the scale-like flower bracts 2-3 mm long. 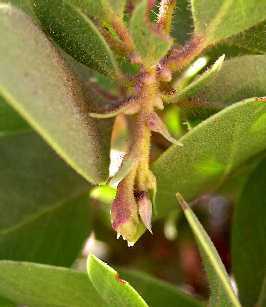 If it has hairs, you've found the hybrid, which can be confirmed by the leaf-like flower bracts 4-10 mm long. If there is no fruit, look at the petiole. If it has obvious hairs on it as in the picture above, you've found the hybrid. If the hairs can only be seen with a hand lens, you've found A. patula. I intended to sample three specimens for each taxa that were clearly separated along the trail. I only found two specimens of the hybrids. I decided against sampling a third A. patula since plants of that species seemed remarkably uniform, and I correctly thought in the field that I had enough data to do this preliminary analysis. It was important to sample three occurrences of A. pringlei since I was primarily trying to see how close the putative hybrids were to that taxon. The hybrids are found at the lowest A. patula elevations and the highest A. pringlei elevations, where those two species overlap. The data collected on 16 August 2006 are given in the next table, along with the first two principal components calculated as in the Analysis section. There are more than 20 characteristics in the table since the minimum and maximum size of some characteristics are given separately, as needed for principal components analysis. The plants in the table are grouped by taxon, with the specimen number as given in the previous table. There are no measured characteristics of the fruit for specimen #4 since it had no fruit on the plant, despite having a large number of inflorescences this year. For the principal components analysis, which requires a single value in every field, I gave that specimen the average value of the other two A. pringlei specimens, since the fruit of A. pringlei is very uniform. Also, I replaced the range of values given for the color of the leaf blades for specimens #6 and #7 with the single value of the average of the range. Floras generally call all the bracts in the inflorescence inflorescence bracts, which leads to considerable confusion. In the above, the inflorescence bracts refer only to the reduced leaves (bracts) at the base of each inflorescence branch; the flower bracts are the bracts at the base of the pedicel of each individual flower. Unfortunately, petiole hairiness and pedicel length in fruit were inadvertently not measured in the field, although the photographs above show the petiole hairiness for each of the three taxa. A simple perusal of the data in the table above quickly shows that extremely few of the characteristics of the hybrid fall outside of the range of values for the pure species. 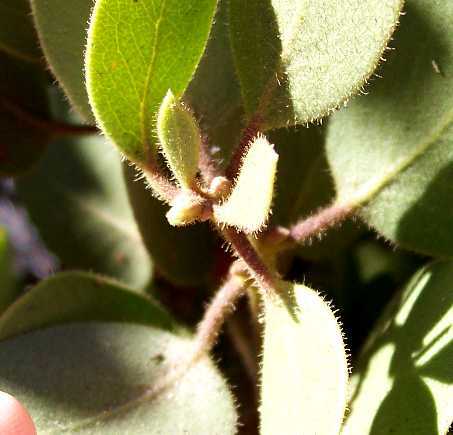 For example, the minimum petiole length of 5-6 mm for the hybrid falls within the range of 3-9 mm for the pure species; it doesn't have values of, say, 10-13 mm. This is strong evidence already that those specimens are indeed hybrids of the two species. If the hybrid plants were actually a different taxon, or a different form of A. pringlei, one would expect it would have at least some characteristics not intermediate between the two species. In the above plot, I've dithered the values for two samples of A. pringlei, with values of 5 mm for both characteristics, by 0.1 mm, which otherwise would plot on top of each other. Also, note that there is variation from plant to plant that is not well sampled with only two or three samples from each taxon. Hence the displayed points are only a sample of the true spread of values for each taxon. The values for the hybrid clearly fall about halfway between the values for each pure species. As a group, they do not fall on any of the edges of the plot. With 27 characteristics in the above table, it takes a lot of plots to examine them two at a time. A much better way to analyze all the characteristics at once is principal components analysis (PCA). With the two characteristics plotted above, PCA would fit a straight line to all the values in the plot to get its first principal component, treating all the values as if they came from the same species. The first principal component would then be the values as measured along that best-fit straight line, which captured the biggest variation in the plot. The minimum values of the first principal component would correspond to A. patula; the maximum values to A. pringlei. The second principal component would be the values measured perpendicular to that best-fit straight line, capturing the rest of the observed variation. The wonderful thing about PCA is that it can fit a straight line to all 27 characteristics at once, capturing the correlation among variables and putting the biggest variation in the 27 dimensional plot in its first principal component. Because the measured traits vary from lengths to arbitrary measures of stickiness, they were homogenized by subtracting the mean value of each trait from individual values in the above table and dividing by the standard deviation, using all sources. Thus the scores for each trait have a mean of zero and a standard deviation of unity, and in this way are all put on an equal footing. The scaled scores for height and width of the plants were not used directly in analysis, since those values also depend on the age of the plants and site conditions. Instead, the ratio of height to width was used. That character, along with every other character given in the table above except for the height and width, were analyzed as a set using principal components. Principal component 1 clearly captures all the differences between the three taxa (see also below). The two pure species are separated by a difference of over 8. Since the unit for principal components is essentially standard deviation, a difference of 8 standard deviations is a huge difference. This wide separation is a simple consequence of how dramatically different these species are. Many species are separated by values of only 1 or 2 in similar plots. Principal component 2 is left with measuring some of the differences within each taxon, and is not valuable in distinguishing the taxa. The major contributors to principal component 2 are such things as the number of main stems and the range in leaf sizes, characteristics that vary widely within each taxon but similarly from one taxon to another. The above plot shows that the spread in principal component 2 is essentially the same within each taxon. The results for the hybrids are striking; the hybrid plants are dead intermediate in principal component 1 between the two pure species. The mean value of principal component 1 for the two hybrids is -0.5, very close to the average of -0.6 computed from the mean value of 3.5 for A. pringlei specimens and the mean value of -4.8 for A. patula specimens. This mean value is exactly what would be expected from an F1 hybrid of the two pure species if enough traits are measured. The sign of the coefficient only signifies which species has higher values for that characteristic; the absolute value of the coefficient reports how strongly the taxa are differentiated by that characteristic. As seen in the plot above, principal component 1 has the highest value for A. pringlei and the lowest value for A. patula. Positive coefficients correspond to characteristics where I used higher values for A. pringlei, such as flower bract sizes and twig stickiness. Negative coefficients correspond to characteristics where higher values correspond to A. patula, such as petiole length. This simply corresponds to a best-fit line that has negative slope in the plot above of maximum petiole length vs. minimum flower bract length. An amazing 24 of the 27 characteristics given above show significant separation between those taxa. The only coefficients with values between -0.1 and 0.1 are the blade length and the number of main stems, characteristics that vary similarly within each taxon. Looking back over the raw data given above, it is clearly seen that the hybrid shows intermediacy in nearly every trait. Hence it is not just one or two characteristics that managed to produce the overall intermediate principal component 1 value for the hybrids; essentially all of the characteristics contribute. This is very strong support for the F1 hybrid hypothesis. 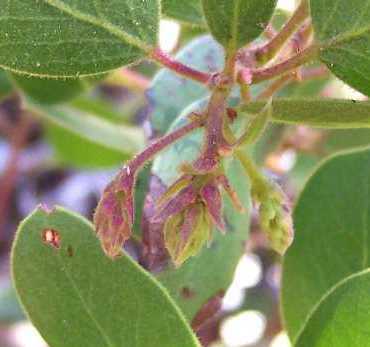 The Jepson Manual group key specifies that the group that contains A. patula has sepals ± appressed, and the group that contains A. pringlei has sepals ± reflexed in fr. That characteristic appears to actually be reversed in these taxa. 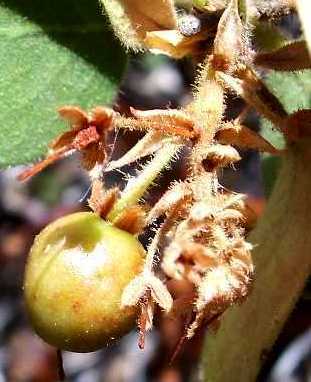 I checked a lot of fruit of A. pringlei on the South Ridge Trail on 2 August 2006; all had sepals appressed. Also, I photographed a fair number of fruit on the PCT above the Devils Slide Trail on 11 August 2006; nearly all had sepals ± reflexed. Also see the above pix for examples of both. The Jepson Manual description for A. pringlei says fr ± short-pointed. All the A. pringlei fruit examined on 16 August 2006 has been smoothly spherical at their tip. Of course, it is possible the fruit develops a point when it reaches final maturity. The Jepson Manual description for A. patula says blade glabrous. 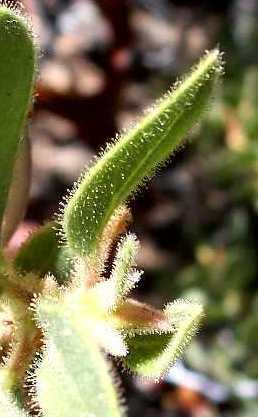 Although the blade is glabrescent, there definitely are minute hairs present as described above in young leaves. It is possible that these hairs are mostly only present in first-year leaves that become glabrous by the time of the bloom the following year. However, I have pictures of A. patula in bloom that show the same hairs present then. On 21 August 2006 I mapped the distribution of all three taxa on the Devils Slide Trail, as well as on the access road immediately below Humber Park. The access road was included since James Dillane and I had previously found a specimen that looked like it might be the hybrid there on 11 August 2006. Investigation on 21 August 2006 confirmed it was indeed a clear example of the hybrid. The hybrids are thus not confined to the overlap region in elevation of these two species. However, I note that the hybrid on the access road is located in front of a water tank, as well as immediately next to the road, and hence may be a planted specimen. It is also possible that hikers, horses, or even water runoff carried the seed of a hybrid down the trail to this location. Above Saddle Junction, there are no A. pringlei specimens; below Humber Park, there are no A. patula specimens. It remains to be seen how extensive the hybrid population is in other areas. The elevations are all from GPS readings, which are fairly inaccurate here due to the dense tree cover and presence on the side of San Jacinto Mountain. In particular, all the specimens alongside the Devils Slide Trail should have plotted on or very close to the trail, implying a relative error between the GPS of the trail (done on a different day) and the specimens of up to 300 feet in some locations. This error is insignificant for my purpose here. The plot shows that A. patula is found above ~7200 feet elevation, with A. pringlei found below ~7400 feet elevation. Two of the hybrids are found in the overlap region between ~7200 and ~7400 feet, with the third hybrid found at ~6400 feet. Further mapping work will show if the hybrid plant location at 6400 feet is anomalous or not. On 5 and 10 October 2006, I surveyed the Deer Springs and Suicide Rock Trails for hybrids, and found three more specimens. 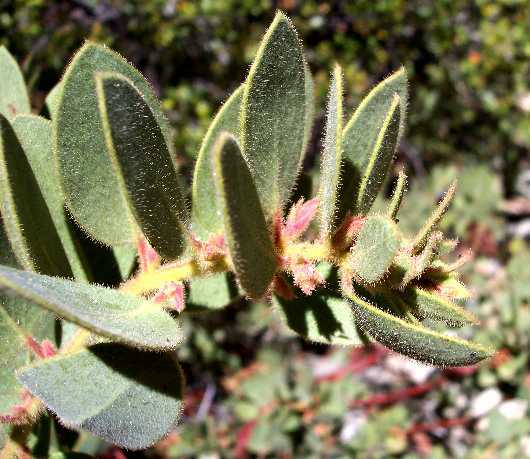 One was found at 7100 feet elevation on the Deer Springs Trail, and two nearby plants were found at 7300 feet on the Suicide Rock Trail. On 26 October 2006, I surveyed the South Ridge Trail for hybrids, and found no specimens. Specimens of the two parent species were separated by a dense patch of forest, which may have prevented any hybridization from occurring there. The first plot above is a conventional map view; the second plot shows the elevation vs. longitude. It should be kept in mind that surveys were done only on and immediately adjacent to the plotted trails; the distribution of the species elsewhere on the plots is unknown. All specimen locations, including elevation, are from GPS readings in the field, and hence can differ from the true elevation by the error in the readings. In general, the GPS accuracy for the Deer Springs and South Ridge Trail is much better than for the Devils Slide Trail. The Suicide Trail is the branch to the right off the Deer Springs Trail. No A. patula were found on that trail, and only the highest elevation A. pringlei is plotted. The Deer Springs Trail has a very dense concentration of A. pringlei along its portion below the Suicide Rock junction. Since there are way too many plants to individually GPS, I simply placed points for A. pringlei all along that portion of the trail. Above the Suicide Rock junction, the highest 18 specimens of A. pringlei are shown, along with the lowest elevation A. patula. The South Ridge Trail also has a very dense concentration of A. pringlei below 7000 feet elevation, and so again only representative points are placed for specimens below 7000 feet. 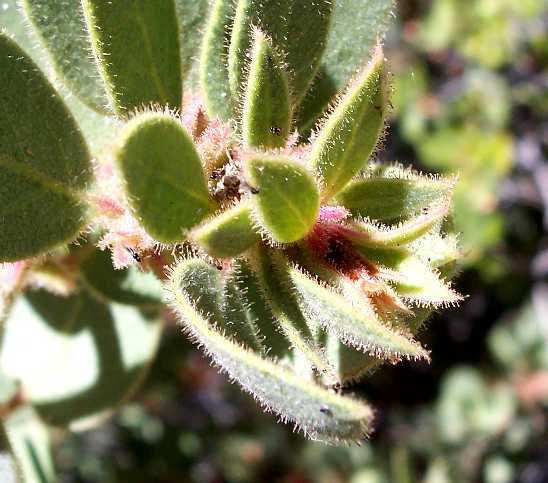 Note that A. pringlei is found at much higher elevations on the South Ridge Trail than on the other two trails, consistent with the warmer, drier location here that also causes chaparral species to be present on the southwest side of the South Ridge. The trails were not surveyed above 8000 feet for further A. patula specimens, of which there are many. The relative lack of A. pringlei specimens on the Devils Slide Trail is due to the lack of suitable habitat there for that species. That area is mostly in drainages, and hence is much wetter, with a much higher density of trees, than the mostly-ridge location of the other two trails. That habitat also allows specimens of A. patula to be found at much lower elevation than on the other two trails. Hybrids would be easier to produce on the Devils Slide Trail since the abundance of the two parent species is more nearly equal there. In contrast, on the other two trails, the high abundance of A. pringlei specimens would make it difficult for A. patula pollen to successfully create a hybrid. On 8 November 2006, I photographed the nascent inflorescences of the hybrid and A. patula, and the ends of the twigs of A. pringlei. The nascent inflorescences on the hybrid greatly resemble those of A. pringlei. This observation immediately rules out the hypothesis that these hybrid specimens are a form of A. patula. Thus the nascent inflorescences strongly confirm the hybrid nature of these specimens. I will watch to see if some twigs on the hybrid produce blooms next spring in the same manner as A. pringlei, without any dormant phase of the inflorescence. The following photographs show the nascent inflorescences of A. patula on the left, and those of the hybrid on the right. 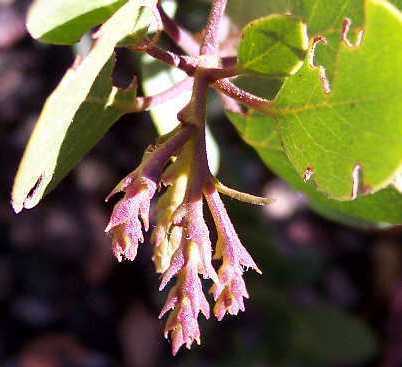 The inflorescence of A. patula is typically quite pink-purplish, elongate and multibranched, whereas that of the hybrid is yellow-green to pink-purplish, more clustered at the end, and sometimes has only a single branch. The inflorescence bracts of the hybrid are much leafer, and its flower bracts are more leaf-like as well. In addition, the inflorescence axes of A. patula have nearly sessile glands, whereas those of the hybrid have long-stalked glands. 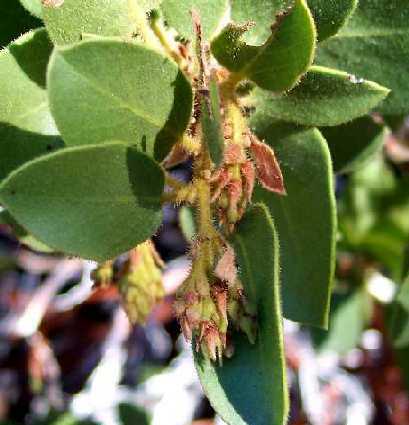 Detailed analysis of 20 characteristics has shown that there are three specimens on the Devils Slide Trail in the San Jacinto Mountains that are hybrids between Arctostaphylos patula and A. pringlei ssp. drupacea. Nearly every characteristic shows the intermediacy of the hybrids. The hybrid nature, deduced from analysis of characteristics present on 16 August 2006, was dramatically confirmed by clear intermediacy seen in the nascent inflorescences that were present on 29 September 2006 and 8 November 2006. Two of the three hybrid specimens on the Devils Slide Trail are located precisely in the narrow range of elevation where the two parent species overlap. The third is found at an elevation lower by ~800 feet. Surveys on the Deer Springs Trail and Suicide Rock Trail found three additional hybrids that again are found between 7100 and 7300 feet elevation, within the narrow range of elevation where the two parent species overlap. These hybrids span a distance of ~1.8 air miles. A survey on the South Ridge Trail found no hybrids. The lack of hybrids here might be expected from the significant separation in distance of the two parent species combined with a possible barrier to pollinators between them. The higher elevation of the overlap zone between the parents there might also make it difficult for any hybrids to survive even if hybrid seeds are produced. These hybrids are much rarer than the parent species. There are literally thousands of each parent species in the area surveyed so far, yet only six hybrids are known. Thus considering all elevations, the hybrid population is less than ~1% of the total population of the parent species. However, in the elevation range where the two parents overlap, these hybrids make up something like 10% of the total population of the parent species. 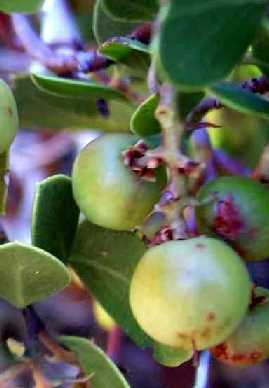 Future work will survey other trails for all locations of Arctostaphylos specimens, to further map the distribution of this hybrid population. In spring 2007, I'll survey for blooms to see if there is a difference in the blooms and / or bloom times for the hybrids and the pure species. I thank James Dillane and two anonymous people for help with the analysis of some of these specimens on the trail on 11 August 2006 when the hybrid hypothesis first occurred to me.